A complete electronic drum kit for the determined beginner. The Alesis Nitro Mesh 8-Piece Electronic Drum Set with the Simmons DA25 amp delivers the most realistic playing experience for every drummer, and it remains perfectly quiet in situations when you don’t want to disturb anyone. 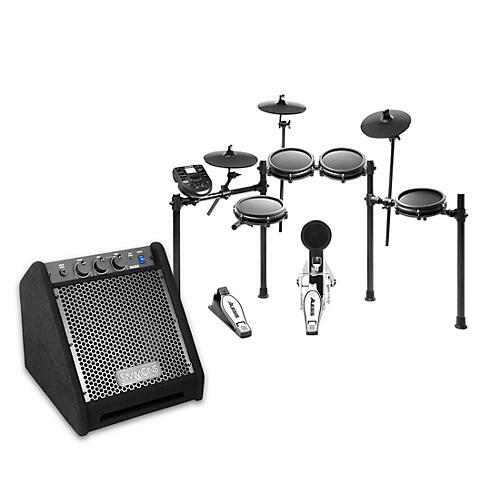 It is a complete 8-piece electronic drum kit centered around next-generation Alesis mesh-head drum technology. Mesh heads are the unanimous preference of electronic drummers for their natural feel and ultra-quiet response. Affordable electronic drum amplification from Simmons. The Simmons DA25 is the perfect first electronic drum amplifier for the beginning drummer or for anyone looking for a great ‘grab-n-go’ drum sound system for home use and practice. With a full 25W of clean power, it easily handles full volume without distortion, and with its separate low frequency and tweeter drivers, the DA25 produces a full-frequency range, important for hearing the frequency and dynamics of electronic drum sounds. The built-in 2-band EQ allows for sonic customization to match the venue or performance situation. And the DA25’s slanted cab design helps direct all that great sound toward the drummer, allowing the player to hear themselves clearly during practice and rehearsals.